You’ve been driving around town running errands all day. You’ve finished the last stop and you’re in your car ready to head home. You put your key into the ignition, turn it… and nothing happens. Oh great, you’ve got a dead battery! You try again. Still nothing happens. You start to panic and think you are the poster child for Murphy’s Law. You think to yourself how could this happen? The car was driving fine all day. You reach for your cell phone to call for help. We have all been in this type of situation at one time or another. However, situations like being stranded with a dead battery can be avoided if you pay attention to the warning signs. Yes, there are warning signs! Do you know what signs to look for? 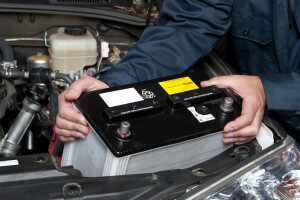 There are a few symptoms of a worn out battery. 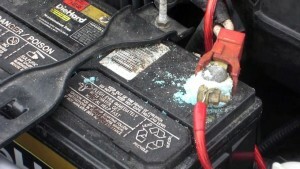 If you smell rotten eggs, your battery may be leaking. Is your engine slow to crank? Do you hear a whirring noise when you try to start your car? Are your dashboard lights flickering? If you see any of these signs you’ll want to get your battery’s health check right away. You can always check your battery’s health yourself, but we recommend having a certified technician take a look. You can always schedule an appointment with our Ford Service department and our service advisors will be glad to let you know if your battery needs to be replaced. If you chose to check your battery yourself, we highly recommend taking the following precautions. If you smoke, put out that cigarette! Make sure you shut off the engine before working on the battery. If you happen to get any acid on your skin or clothing, wash it off with water immediately! First, make sure you are using the proper size wrench and remove both of the cables from the terminal post. Be sure to remove the negative cable (the black one) first. Then, you’ll want to check the terminal posts and clamps for any type of debris or deposits. If there is, you’ll want to scrub them off with a steel wool pad or a battery terminal brush. If you don’t have either of those, you can use an old toothbrush. After that’s done, you’ll want to inspect the battery cables and clamps. If they are corroded or frayed, you might need to replace them. If they are worn, it could cause your battery to short-circuit. When that’s done, look at the battery itself. If it’s sides are swollen, bulging or cracked, it needs to be replaced immediately. When you bring your car to Ford Service or to Quick Lane and get The Works service package, your battery’s health is automatically checked as a part of the multi-point inspection included in that service. We’ll provide you with a printout that shows the health of your battery and if it needs to be replaced. 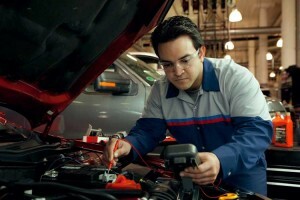 If you have any questions about your car battery’s health, be sure to Ask your Service Advisor for more information. They will be more than happy to help you keep your car rolling and avoid any bad situations!